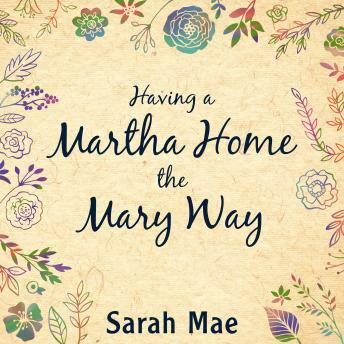 Sarah Mae wants to let you in on a little secret about being a good homemaker: It's not about having a clean house. She'd never claim to be a natural, organized cleaner herself-yet, like you, she wants a beautiful space to call home, a place where people feel loved and at peace. Where people can really settle in with good food, comfy pillows, and wide-open hearts. Is it possible to find a balance? To care for your heart-and your home-at the same time? Journey with Sarah Mae on this easy, practical 31-day plan to get you moving and have your house looking and feeling fresh. But even more than that, you'll gain a new vision for the home of your dreams, and how to make it a place of peace, comfort, and community. Having a Martha Home the Mary Way will inspire you to find a happier, healthier, and cleaner way to live.